I have another Oldie But Goodie CASE for you. This time I picked this card by the fabulous Betsy Veldman, made in 2010. 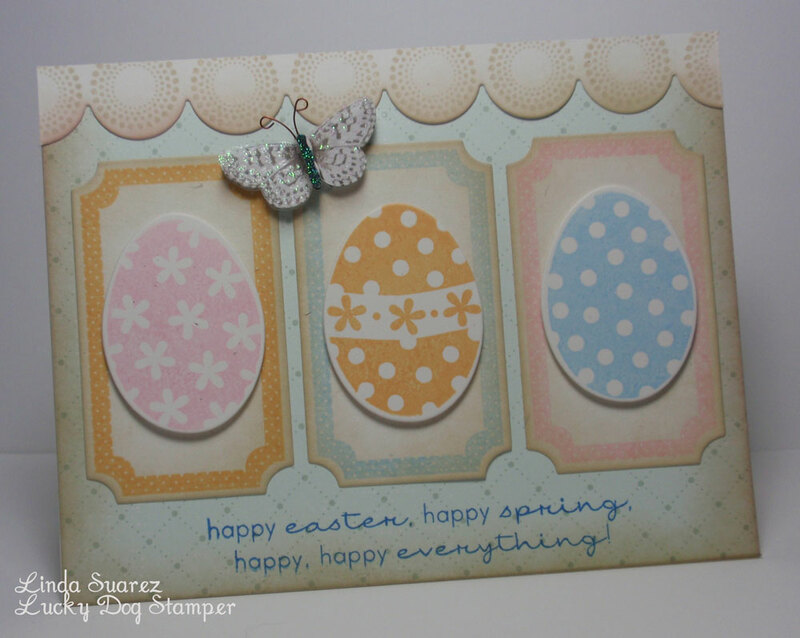 This card was one of the reasons I bought Papertrey Ink's Egg Hunt stamp set. At the time I was still fairly new to stamping and cardmaking and this stamp set was in my first Papertrey Ink order. I was way too intimidated at the time to try to make a card like this. Ah, but now I have a year of stamping and cardmaking experience (and over a hundred Papertrey Ink stamps sets later - gulp! ), I am ready for it! Easter totally snuck up on me, I think because it was later this year, and I wanted to make special cards for my folks and my mother-in-law. I remembered this card by Betsy and looked it up - still as gorgeous as I remembered. I think it turned out nice, but ... I clearly went overboard with the Tea Dye Duo Chai ink on the patterned paper. I should have just touched the edges instead of applying it with a sponge. And there was no way I could cut out that butterfly - how did Betsy do it? I tried, it was a mess. I could have skipped the butterfly but I thought it was a really nice touch. 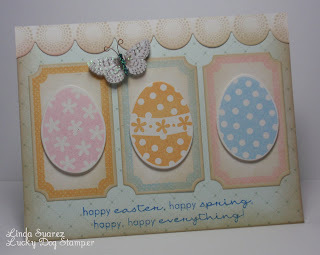 I dug through my embellishments stash and found this cute K&Company butterfly and I think it works. I especially liked the scallop with the Dot Spot stamp - it really makes it look like lace. What a great idea! My folks and mother-in-law will love the cards! Thanks Betsy! Great job on your case. Maybe she had a die for the butterfly? Linda you did a great job and I think the inking is just right! 100 stamp set! You've got me beat! Gorgeous card! I like it as much as Betsy's :) 100 sets--wowsers!! I'm impressed. Awesome card! You did not go over board on the inking!! It looks great! I love that look and it is so easy to do! Feeling Green Around the Gills?